This printer is different. Rather than using liquid ink which is sprayed on to the paper through fine nozzles, the Xerox Phaser 8500 uses sticks of solid ink, which are melted and transferred in dots to a drum. This then transfers them to the paper. It's like a hybrid between an inkjet and a laser printer. 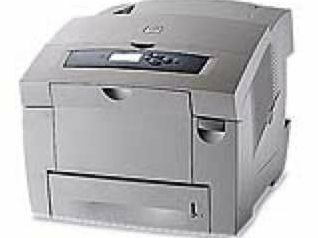 It's also a bulky machine, looking more like a laser than an inkjet, but it has some of the advantages of a laser, too. These include two substantial print trays, which between them can hold 625 sheets, a PostScript level 3 interpreter as standard, and low running costs. You only need to replace the solid ink every 3,000 pages and it comes in handy shape-coded sticks, which only fit the correct hopper located under a cover in the printer's top surface. The printer has a backlit, six-line LCD display, which shows a control menu and little animated diagrams, should the printer need maintenance. Six buttons help navigate the menus. The print driver is comprehensive and reasonably easy to install. Print speeds are amazing, with both our five-page documents completing in 24 seconds and the 15x10cm photo print coming through in just five. Even including processing time, the whole print still took only 38 seconds. Text print quality is sharp and without feathering, again more like a laser print. Photographic output shows the smaller gamut of solid ink technology and images are not as vibrant as with liquid ink. If you're buying a printer primarily to produce high-quality photo prints, then the Phaser 8500 is not the solution. However, if you want a printer that can reproduce text and graphics at very high quality and do a fair job with images, it could be ideal. Costs are low and it prints like lightning.